May and June are full of bike events that are important to John and me. Up until my retirement in January 2013, I worked every Saturday and Sunday. So, while everyone was having fun doing these events, I was lugging books at the bookstore. I’ve been a busy volunteer – anyone who knows me knows that I’ve done some serious arm-twisting for volunteers on bike events in the past. So, it’s been a good chance for me to reciprocate. One of the funnier volunteer gigs was pouring beer (as a volunteer worker for Juvenile Diabetes Research Foundation) at the Motley Crue/Alice Cooper concert. Omg – it was deafening! CAN YOU HEAR ME NOW???? My hearing may not recover for months! 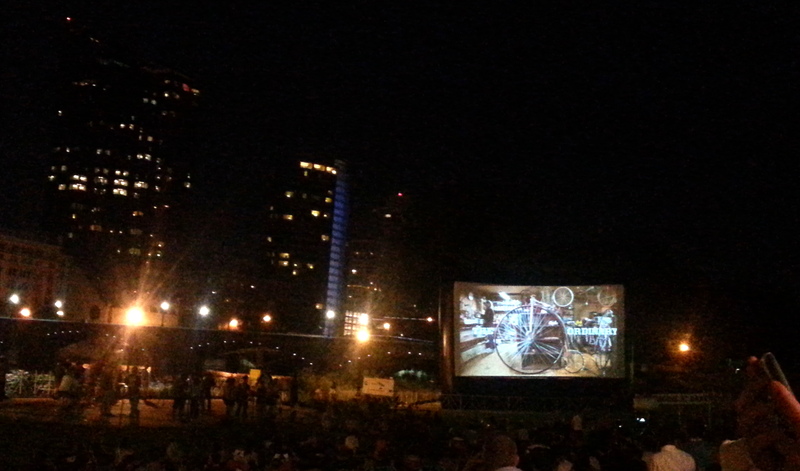 We are lucky in Grand Rapids to have the New Belgium Film Clips and Beer Festival come to town. 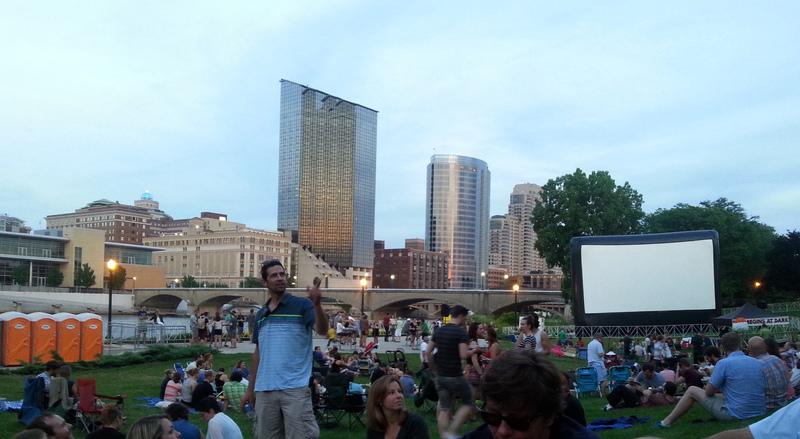 This is an traveling outdoor film extravaganza of short clips, augmented by great beer – set in Ah-Nab-Awen Park in Grand Rapids, right on the downtown riverbank. Best of all? 100% of the proceeds from this event – beer sales, merchandise sales, raffle tickets (our friend Troy won a $4000 custom fat bike!) 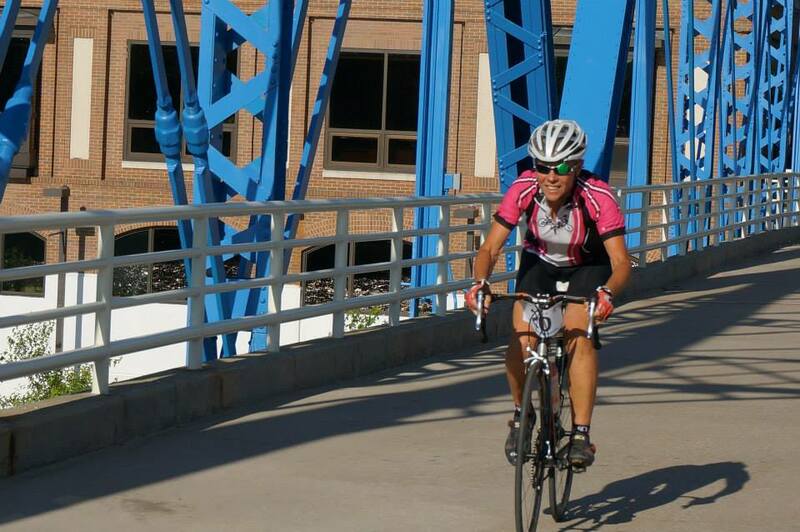 go to support the Greater Grand Rapids Bicycle Coalition. Nearly $14,000 this year! 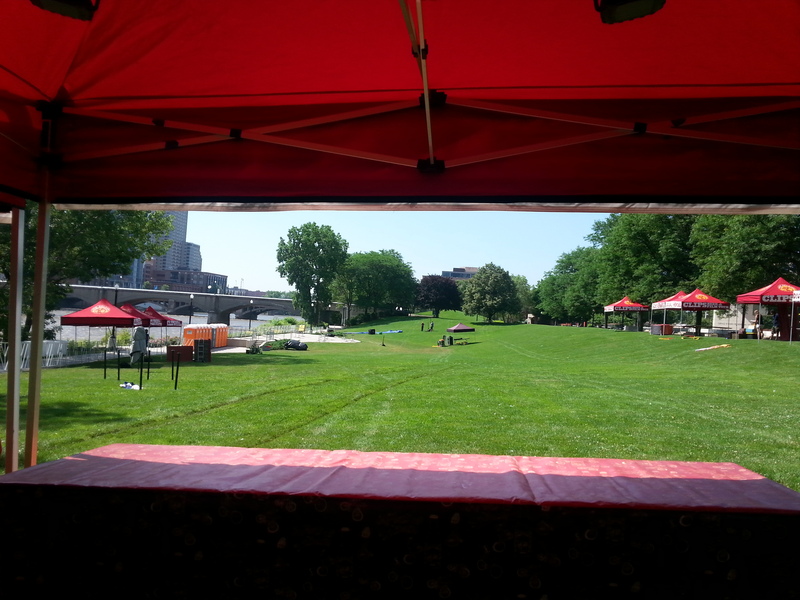 So, one very hot sticky day was donated working setup for the event – I helped push up probably 20 Easy Up tents. My shoulder was so sore the next day, I could hardly move! Worth all the effort – what a wonderful event. Grand Rapids is so lucky to be one of 25 (give or take) cities on this Tour. Here’s our site from under one of the Easy Ups…. The crowd gathers…. Showtime! The day after the Festival was the Gran Fondo (Italian for Big Ride), a chip-timed 40 or 80 mile bicycle rie from Grand Rapids to the Lake Michigan lakeshore and back. 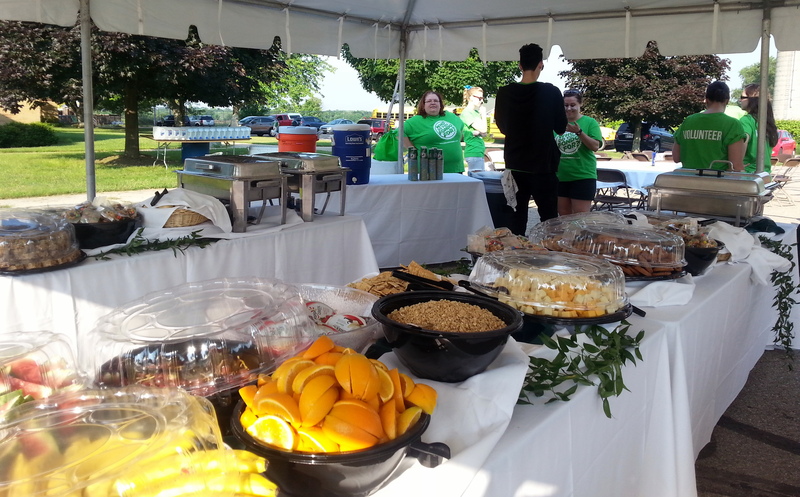 Now in its second year, the Fondo is a fund-raiser for the MSU College of Human Medicine. It was great fun to be a volunteer at the first rest stop on the 80 mile leg – although many of the early riders were in race mode, and didn’t stop. Downtown Grand Rapids was transformed to a big street party following the Fondo, punctuated by the Grand Rapids Criterium (bike race) for the afternoon. 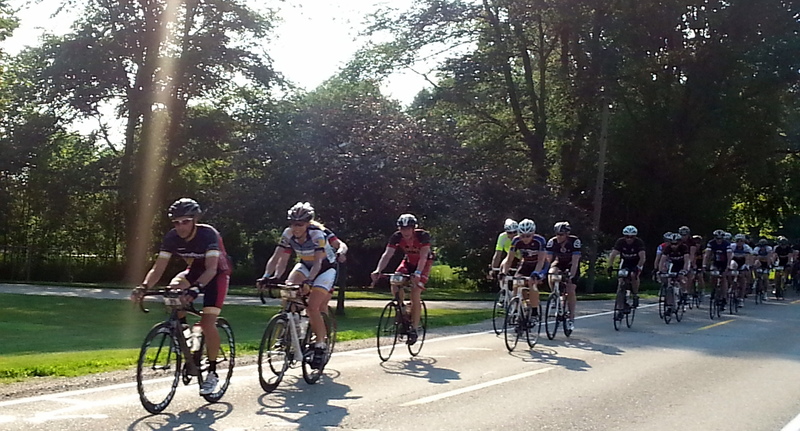 It was a great weekend for cyclists. In the meantime, there has been lots of work to do on the Fireball. 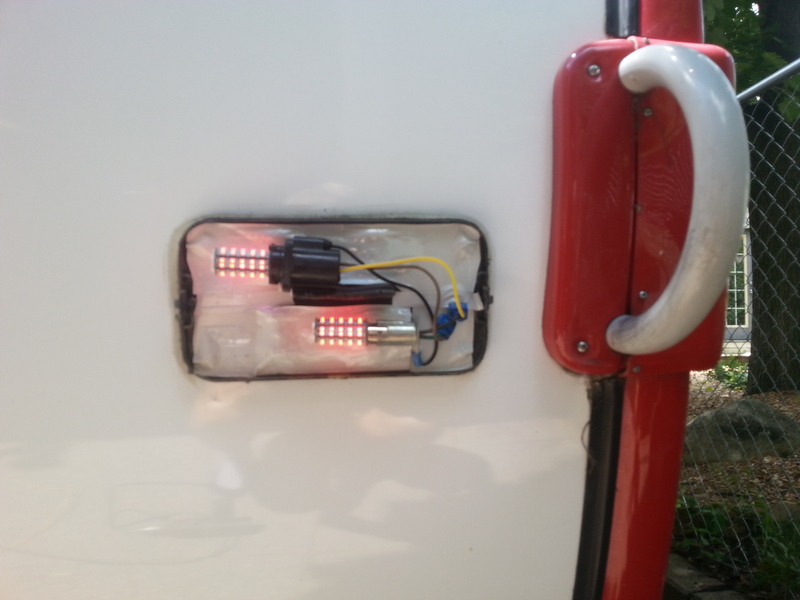 After losing license plates in Utah (2014) and Texas (2013) due to the flimsy license plate bracket that was part of a taillight assembly, John rigged a new bracket. This is our LAST license plate! Taillights were another issue. If you had ever followed at night, we weren’t very well lit. All changed with our new LED configuration. Caulking the underside? Check! Cleaning/waxing? Check! 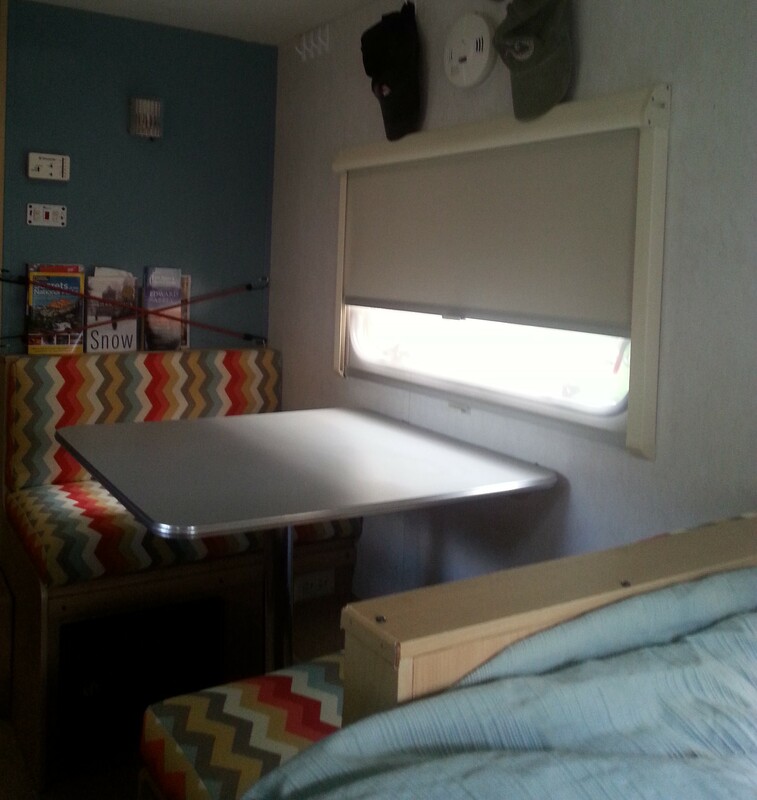 My project list included recovering our dinette seats and painting one wall. I’m very happy with the results. Task list for the Fireball still includes updating the flooring and the radio. But, in the meantime, we’re finally going to hit the road for about 10 days. Heading to Nordhouse Dunes, our favorite camping spot in Michigan. After five days, John is leaving to go tent-camping and cycling with the boys in Empire (near Sleeping Bear National Lakeshore), and Caroline is coming to camp with her teardrop trailer and her mountain bike. Should be big fun. She can only stay a few days though, then it will be Jezzy, me, the bears, my mountain bike, and the beach for a few days until John reappears. Back to the good life! 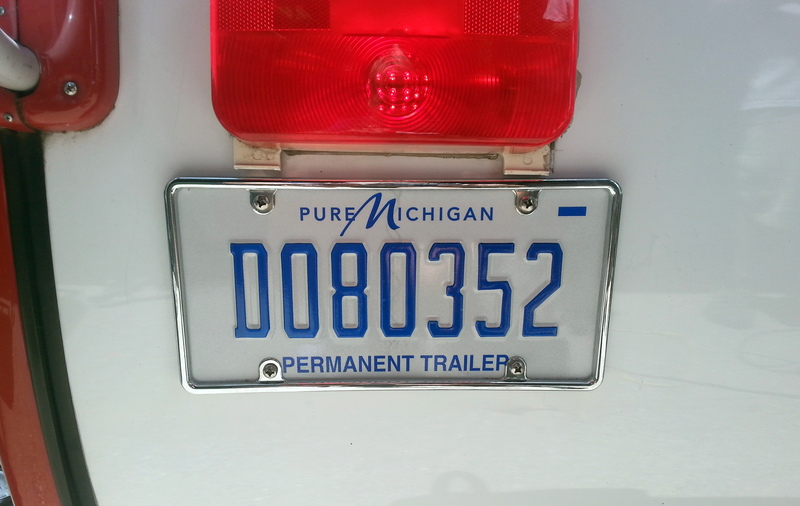 This entry was posted in beer, camping, cycling, Michigan, retirement, T@DA, trailer modifications and tagged beer, camping, cycling, Michigan, T@DA by Judy Crankshaw. Bookmark the permalink. I wish I had half your energy and bravery. Go Judy! Love your new cushions and painted wall!! Looks great! We’re in TN on our way home from the north – it’s been a wonderful trip! Thanks, Susan. Your colorful interior was one of my big motivators for change. You sure did hit Michigan in an unseasonably cool, rainy period. Try again next year and we’ll hope to put on a better show for you. Safe travels. The weather in the UP actually wasn’t bad. We never had any rain that made us change any plans. The Upper Peninsula rocks! We loved it! We are hoping to get Up North (as we Trolls call it) next month. Glad you enjoyed it – loved all your photos. Nice work on the T@DA and congrats on the drag race. This weekend, we’re off to Purcellville, VA for a leisurely ride on the Washington and Old Dominion trail followed by a food and wine festival. Next weekend a camping trip to James River State Park along with a wine event at Poplar Forest. See a trend here? Camp wait for some cooler weather to arrive!!! I love what you’ve done to the interior. Love your cycling photos too. The drag racing event sounds awesome–congratulations! Now I can say that I’ve drag-raced, and am retired. Check! After seeing all the colorful interiors at the BRR, recovering/painting was the first thing on my Fireball to-do list. Can’t wait to replace our blah floor. Congratulations on winning the drag race! You’ll have to do a lot of cycling to burn off all the calories that come with your prize. Have a great time while camping. Thanks, Jerry. Does anyone really need to know that nobody else entered in my age category? Nah…. No, we’ll keep that a secret. Alice Cooper, one of my first concerts in the 70s. Snake and all…..
Have a sweet gal getaway….pack a warm blanket. This cool off is lovely sleeping!! Motley Crue/Alice Cooper was a Geezerfest! Happy that they all had enough money for $8.50 draft beers, though? Have to admit that we were all dancin’ to Schools Out For the Summer! 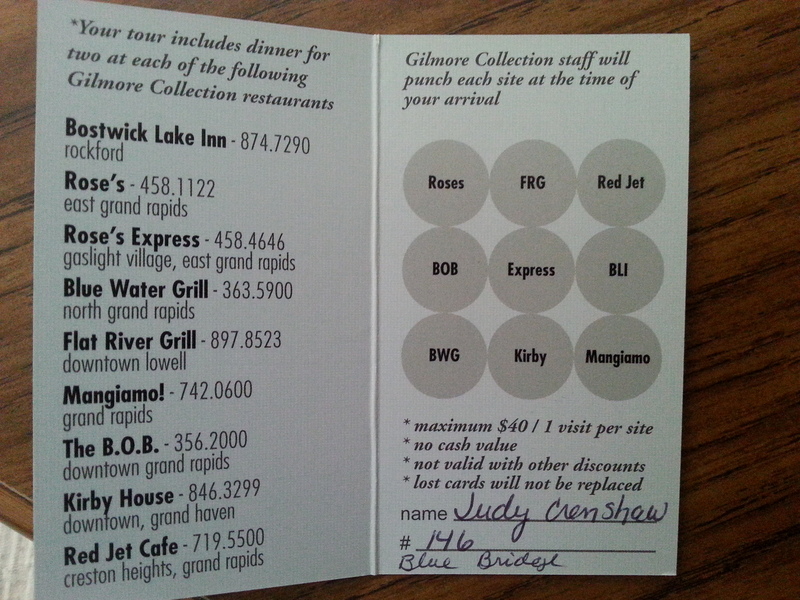 Have a great time Judy! Will do. Hope it quits raining sometime…. I ran that license plate through DMV and it’s NOT clean….. I believe that would qualify as an abuse of your DMV privileges. Right, Counselor?